Oil is life's blood for an engine. Fuel may be the food that keeps it running, but without oil, the engine will die in spite of the fuel available. Normal procedures tell us to check for oil pressure within 30 seconds of engine start. When the pressure gage starts to rise, we feel assured that the engine is being properly lubricated. But, has the engine been properly lubricated just because we now have oil pressure? The answer is a resounding "No!" It is now. But it wasn't! During those brief moments from starter engagement, engine firing and up to oil pressure rise, the engine runs without sufficient lubrication. Depending on frequency and duration of operation, very significant wear is attributed to this short interval . If the engine is run frequently - every day - less wear occurs during start because oil is retained on critical surfaces. However, if the engine sits for long periods - days, weeks or months - then the oil will evaporate and drain from critical parts, and they will run without lubrication until oil flows sufficiently to pressurize the entire system. Some technical studies have shown as much as 70% of total engine wear to this starting interval. Eliminate that interval without oil and the engine should last much longer. Different parts of an engine have different lubricating needs. Gears, such as those in the accessory section, need oil on the surfaces to prevent distress. Gears without lubrication wear badly. Lubricated gears last nearly indefinite. Plain bearings - mains and rods - need oil at the onset of motion to prevent contact between the crank journals and the bearings. Bearings without lubrication wear rapidly. Lubricated bearings last nearly forever. Cylinder walls need oil to lubricate the pistons and piston rings. Without lubrication, the pistons and rings wear quickly and oil consumption increases rapidly. With lubrication - little as is needed - pistons and rings have extended life with little wear. Cam lobes and lifters endure high loads even during start. Without lubrication, both lobes and lifters gall badly (a la Lyc O320 H2AD). With lubrication, both last for hundreds of hours with little wear. Hydraulic valve lifters need oil under pressure to operate properly. Without a constant flow of pressurized oil, lifters collapse and take a pounding as the valve system operates with excess clearance. With lubrication, the lifters extend properly and valves operate with correct timing and little undue distress. Valve stems and rockers require little oil to operate. Yet, they still require some to avoid unnecessary wear. Run while dry of oil, either one will experience undue wear. Turbochargers require special attention during start to avoid bearing and shaft wear. If the engine starts with little hesitation, exhaust flows quickly and will initiate turbocharger rotation. If there is no lubrication for the turbo's shaft, it will wear quickly and will require a premature overhaul. If the shaft is well lubricated before motion begins, very little wear will take place, and the turbo's time to overhaul will be greatly extended. In brief, all engine parts need lubrication at the first onset of motion to keep wear to a minimum. Preoiling the engine by pressurizing the lubricating system and pumping oil through it before starting will eliminate that high wear interval usually experienced during start. Changing the oil and filter at regular intervals is preferred preventive maintenance. Insidious as it may seem, however, this maintenance item creates special conditions for wear. First, oil must be sucked into the oil pump before flow begins. Second, air in the filter must be purged before oil can flow to the engine. In the process, purged air must be evacuated through the engine. For a short time, air will lubricate critical engine parts while it is pumped through the engine. Air is purged easily from oil filters that mount upright (open end up), and they remain filled with oil after engine shut down. Horizontally mounted filters are also purged easily and remain filled after engine shutdown unless air leaks into the filter. Filters that install inverted, however, - Bonanza IO520's in particular - empty after each shutdown and must be refilled during each start. Anti-drain valves in the filter prevent oil back flow into the crankcase, but air trapped in the inverted filter turns it into an accumulator. Oil evacuation from the filter is virtually guaranteed after engine shut down as the compressed air forces the oil out of the filter and through the oil system. Time to refill the filter is brief, but during that interval oil flow is reduced and some air may again be forced through the lubricating system with the oil. Wear takes place. Preoiling will fill the filter with oil and purge the air. Wear from insufficient lubrication will be eliminated. Preoiling has requirements and limitations that must be observed. First, pressure should be low enough to avoid harm to the engine. In all aircraft engines, the oil pressure relief valve will serve this function. Second, oil injected into the engine must be filtered. Properly attached, a preoiler will inject engine oil into the engine oil filter just as the engine driven oil pump does. Third, no oil leakage should be created by preoiling. Normally aspirated engines have no components of concern; however, turbochargers require special limitations. Most aircraft turbocharger shaft seals are not true seals that would deny all oil passage. Instead, the seals are slip rings that allow some oil to pass under pressure if there is no opposition. During normal operation these seals rely on positive deck pressure in the compressor housing/intake manifold and exhaust pressure in the turbine housing to oppose oil pressure. Most turbocharger installations also incorporate a scavenge pump to draw the oil from the turbocharger housing. However, when the engine is not running, none of these oppositions to oil leakage exist. To the contrary, the scavenge pump acts as a seal to prevent oil return to the crankcase. Continued preoiling would build pressure in the turbo housing, and oil would be forced out both compressor and turbine seals. Pressure cutoff switches and/or strict limitations on preoiling time must be incorporated to prevent undo leakage from the turbocharger. With these limitations, turbochargers benefit tremendously from preoiling. A preoiler can be used to lubricate an engine without starting. Turn the preoiler on and spin the engine through several turns. Oil will flow to all parts of the engine and the cold thick oil will be slung onto all of the cold metal where it will stay for an extended time. Engines with cylinder lubrication ports in the connecting rods will also have well oiled cylinder walls. Of course, if the preoiler is run for extended time without external power, the battery will need recharging. If the engine is turbocharged, the oil line to the turbo may have to be capped to prevent excess oil leakage from the turbo seals. This is a small chore to insure good lubrication to the rest of the engine. 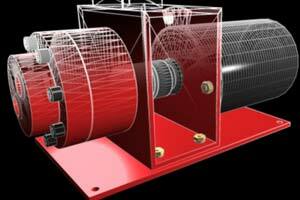 Oilamatic, Inc. has been developing preoilers for several different engine applications. Recently, they have received FAA STC and PMA approval for preoiler installations on several aircraft. Prices of kits range from $1395.00 to $1545.00 and include all fittings, wire and hardware. Hoses must be procured separately. 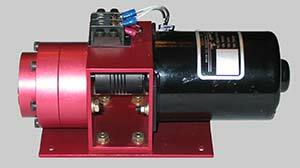 The Oilamatic engine preoiler unit is a 12 or 24 volt electric motor driven pump. The custom designed and manufactured pump is plumbed into the engine oil system using special adapters so that oil is drawn from the crankcase and injected directly into the engine through the oil filter. The pump and motor are sized to provide adequate preoiling for a cold engine while keeping battery draw to acceptable limits. A check valve in the high pressure side isolates the pump from the engine once the engine is started and the pump is turned off. A dash mounted switch operates the preoiler (with Master switch on). The pilot can monitor preoiling on the engine oil pressure gage and turn the pump off as the starter is engaged. 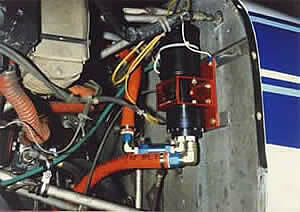 Typical installations provide oil pressure stabilized near the "bottom of the green" before start. No air is left in the system, and all parts are lubricated before their first motion. No matter how long the engine has been sitting, it is fully lubricated before start instead of after. In summary, preoiling an engine can reduce that excess wear attributed to insufficient lubrication during start or from ill affects of long periods without operation. It is most comforting to see the oil pressure gage reading in the "bottom of the green" before the propeller starts turning.